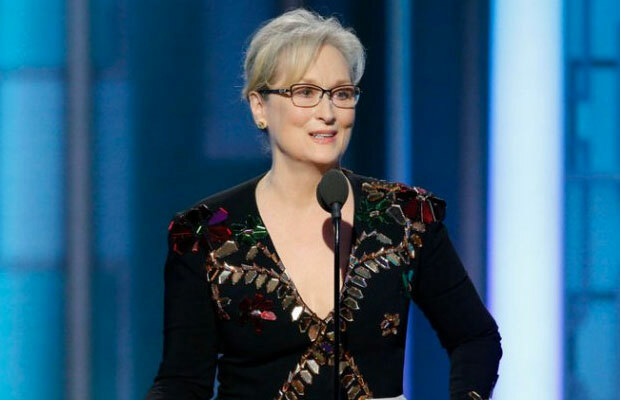 Actress Meryl Streep strongly criticised US President-elect Donald Trump in her speech when she received the lifetime achievement award at the Golden Globes. Though, she had not once mentioned his name in her entire speech, the three-time Oscar winning actress made it clear in her speech that she doesn’t agree with his policies and actions. She also called his actions as legitimizing bullying. Ms. Streep had campaigned for Hillary Clinton in the 2016 election. While some showed displeasure over her decision to bring politics to the award show, other applauded her remarks and speech. The actress received the Cecil B DeMille award for outstanding contribution to entertainment. Also Watch Video: Bigg Boss 10 Breaking After Om Swami, Guess Who Gets Evicted! Previous articlePhotos: Chiranjeevi, Kajal Aggarwal And Others At Khaidi No 150 Grand Pre-Release! Next articleBigg Boss 10: VJ Bani, Manveer, Manu Punjabi Gang Up Against Lopamudra Raut- Watch Video!